SUBHEAD: Questioning GMO use and supporting sustainability, food seed sovereignty and a clean environment. 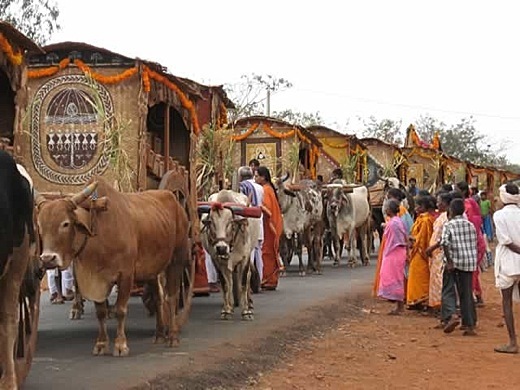 Image above: A caravan of ox drawn carts carrying varieties of indigenous seeds of Indian grain to a biodiversity festival supporting food sovereignty in Andhra Pradash, India, in 2007. From (http://www.grain.org/pe/?id=116). GMO Free Kauai will host a two day event, "Raise Awareness, Inspire Change" on Friday night August 13 and Saturday August 14 in Kapaa at the All Saints Church Gym (the Red Barn). Our special guest speaker on both days will be Walter Ritte from Molokai. Friday night we will premiere the new movie "Malama Haloa" about taro identification specialist Jerry Konanui. We invite all the amazing volunteers and growers on Kauai to celebrate and inspire our shared visions for a self sustaining Kauai. These events are free and will include locally grown, gmo free pupus, dinner and music on both nights. Bring your creativity and ideas to share. For more information please call Mi-Key at 651 9603 or visit hawaiiSEED.org. Special guest Walter Ritte Jr. will be speaking. Walter was involved in stopping the bombing by the US Navy of the Hawaiian Island of Kahoolawe. Ritte was one of the Kahoolawe Nine who made the first protest landing on Kahoolawe on January 4, 1976. Ritte returned less than two weeks later, joined by his wife, sister, and Dr. Emmett Aluli. Ritte was charged with trespassing on the island after being warned not to return, but was acquitted by federal Judge Samuel P. King. He also served in the 1978 Hawaii State Constitutional Convention which established the recognition of Hawaiian Gathering Rights. Walter was also one of the first elected trustees to the Office of Hawaiian Affairs. He is also a voice of opposition to the Molokai Ranch Master Plan that envisions luxury homes at La'au Point. Ritte is married with four children and seven grand children from the island of Molokai, Hawaii. Walter is a hunter and Hawaiian Activist now working on the restoration of traditional fishponds and educational programs based Hawaiian culture. Raise Awareness, Inspire Change: a free community event for sustainability, food and seed sovereignty and a clean environment. Join us at the All Saints Church Gym (the Red Barn) in Kapaa for the free movie premiere of "Malama Haloa" and special guest speaker Walter Ritte on Friday, August 13 at 7pm. Come be inspired to lead and take action for a healthier Kauai. Seed exchange depot by Regenerations Botanical. Enjoy live music with Mike Young. For more information please phone GMO Free Kauai at 651 9603 or visit hawaiiSEED.org. Raise Awareness, Inspire Change: a free community event for sustainability, food and seed sovereignty and a clean environment. Join us at the All Saints Church Gym (the Red Barn) in Kapaa for our special guest speaker Walter Ritte from Molokai. This event will begin at noon on Saturday August 14. Other community leaders will also speak. Come be inspired to lead and take action for a healthier Kauai. We will have a community brainstorm, seed exchange depot by Regenerations Botanical, sign making, sign waving, dinner potluck, music and dancing. For more information please phone GMO Free Kauai at 651 9603 or visit hawaiiSEED.org. DLNR sign modified for KPD? What if Matt Simmons is Right? Dance Nature! - Don’t Drive! Strike one … You’re out?